14~9C, barely any wind, clear. Tonight will get cold. It’s still and quiet here in this valley in North Wales. I got here about three in the afternoon, made camp and decided there was time for a walk. 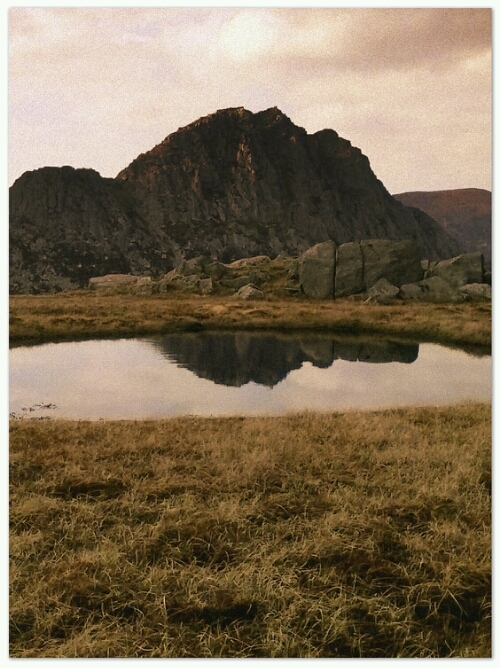 Camp is about a km from Tryfan, which I you to climb tomorrow. It is a rough scramble, so I never wanted to inflict that on Rosie. It’s as strange walking without her as I thought would be. Somehow, it feels wrong. Enough sad thoughts, I am here to unwind and enjoy myself. I walked 5 miles today along the eastern end of the Glyderau- a quiet area, the hordes in west from here. I saw no-one. The Welsh hills are still straw in colour, there is green between the old dead plants from last year, but it’s yet to get going. Mosses look bright enough though. First walks of the year are hard on the front of thigh muscles. I swear every time to train them up to get ready, but never I do. This entry was posted in Hiking and tagged hiking, Snowdonia. Bookmark the permalink. 1 Response to Ogwen Valley, Easter.